Do you live in or have you recently moved to Lichfield? In need of a little assistance or guidance to navigate this beautiful city? It can always be overwhelming moving to a new place, with many things to consider, be it housing, jobs, social life or current affairs. 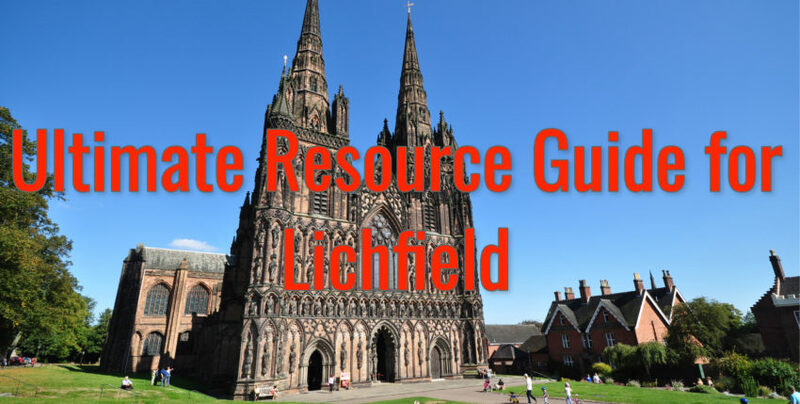 This guide will offer you a little helping hand in understanding Lichfield with relevant resources, tips and tricks. This website is a digital library based at the Institute of Historical Research, brining material from a variety of rich sources – libraries, archives, museums and academies. This website from the Lichfield City Council offers a nice condensed overview of the history of Lichfield. A website that has references to places of historic significance and locations worth visiting such as the Cathedral, Erasmus Darwin House, Samuel Johnson Birthplace, Lichfield Heritage Centre, the Market Place and St John’s Hospital. The Lichfield District Council help support people looking for work, offering support, information, guidance and training. There are a number of work clubs within Lichfield who hold regular meetings. A number of websites that might be useful in your search for a job in Lichfield could be larger job websites or search engines. These website have a number of jobs advertised and can be used when searching for certain regions or specific jobs areas. These websites are updated frequently and are easy to navigate. Trip advisor can be a great source for people visiting Lichfield, suggesting activities to do, places to eat and general tips in how best to enjoy the city. This forum is great for a number of topics, including local issues, directions around the town, politics and events. If you’re into cycling, then this forum could be for you. There is an active Lichfield City Cycling Club. What better way to see Lichfield! An organisation of women who meet twice monthly to socialise, make new friendships and fundraise. A community of camera lovers who have club meetings at the Longdon Village Hall. Meetings including guest speakers, internal quarterly competitions, external inter-club competitions and exhibitions. An amateur dramatics group who rehearse at the The Glasshouse and regularly perform at the Lichfield Garrick. A local community driven magazine that is free, offering local news and advertising. Lichfield Live provides a service for people across Lichfield and Burntwood, providing news, but also interesting and informative articles and content. The Lichfield Mercury is a local newspaper, with interesting stories being featured also on their active facebook account. A leading solicitors established in 1926 who deal with a number of legal issues, such as buying and selling properties, landlord or tenant issues, divorce, wills, probate, debt collection, accidents and employment problems. Ansons solicitors offers ‘no nonsense advice’ and have a number of offices, providing a complete range of legal services to businesses and individuals. Keelys is a law firm who provide a high quality service tailored to your needs, with clients who are well known locally and have strong connections in the Lichfield area. Established since 1984. We specialise in bereavement house clearances, shed, loft and garage clearances plus probate and valuations. Check out this Lichfield house clearance case study and this loft clearance. Jayman was established in 1989 and have a network of offices through the Staffordshire area. They were awarded Estate Agency of the Year Awards in 2013 and 2014. Hunters estate agents is situated centrally in the heart of the City on Bore Street. They offer properties that are equally split between urban and rural housing, covering the city and surrounding villages. A young and dynamic company offering affordable rental properties in the residential market.